Get your buffing and polishing jobs done quickly and easily with the 18V ONE+ buffer/polisher from RYOBI. This 10-inch cordless polisher will make household cleaning tasks a breeze, delivering a quality finish every time. Choosing this buffer/polisher will allow you to make the most of cordless convenience without sacrificing results. You can trust it to take care of your car, motorbike, boat, floor or furniture, giving you a smooth finish that looks amazing. When it comes to innovative battery technology, it doesn't get much better than the ONE+ collection. 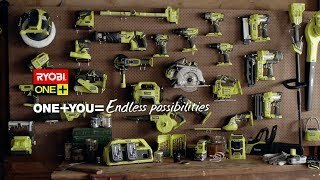 With more than 50 power tools that can be operated using the same battery, this range offers incredible versatility to DIY enthusiasts. Get your RYOBI 18V ONE+ 10" buffer and polisher from your local Bunnings Warehouse today. 18V ONE+ 10" BUFFER/POLISHER is rated 5.0 out of 5 by 1.